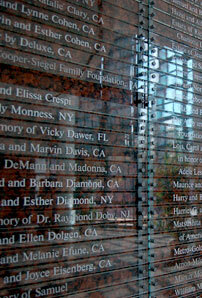 Major gift donors of the Museum of Tolerance are recognized in the appropriate category on the donor walls in the main lobby of the Museum of Tolerance. A centerpiece of the Tolerancenter, this 35-seat interactive exhibit is a re-creation of a 1950's diner that “serves” a menu of controversial topics on contemporary social issues, including hate speech, drunk driving, spousal abuse and gang violence. Through cutting-edge technology using innovative video jukeboxes, visitors have the opportunity to individually interview the main characters in the scenarios and then register personal opinions on the issues raised. The results are then instantly tabulated, providing a springboard for discussion on violence prevention, conflict resolution and personal responsibility. A must see for the hundreds of thousands of annual visitors, the scenarios in the Point of View Diner are updated to confront passing issues of the day. A 35-foot sweep of imposing backlit panels reveal the impact of terrorism and hate crimes on American families and communities, from Oklahoma City to 9/11. The dynamic elements of the exhibit include an illuminated running ticker tape and innovative news monitor continuously updating related breaking stories. In addition, the interactive touch screen terminals of GlobalHate.com take the visitors into the virtual world of digital terrorism and hate, presenting the most compelling examples of the thousands of websites researched by the Simon Wiesenthal Center. This Multimedia experience powerfully addresses today's global human rights crises such as the threats of international terrorism and weapons of mass destruction, the exploitation of women and children, and the plight of refugees and political prisoners. Thirty-six participants in this interactive exhibit, seated in groups, are tested on their knowledge of the issues via automated response technology and then challenged to discuss solutions together. The scenarios are updated to confront the crucial issues of the day, making the Millennium Machine an important highlight for every visitor. Located at the Liberation exhibit, this area is a tribute to the soldiers who liberated Europe. Inspiring visitors to share the enormous sense of freedom and relief felt by many prisoners upon their liberation, the showcase features a US flag made by inmates at Mauthausen Concentration camp. Among the original documents on display are Prime Minster Winston Churchill's speech, made on August 20, 1940, containing his famous quote: “Never in the field of human conflict was so much owed by so many to so few” as well as President/General Dwight D. Eisenhower's book “Crusade on Europe” with the speech he made to the troops on D-Day. There is also a video display and personal memorabilia of American soldiers. Located at “The World That Was” exhibit area, the artifacts displayed capture the richness of Jewish life in pre-War Europe. Artifacts from the Simon Wiesenthal archives and the Alan and Lisa Stern collection are organized into three sections: 1) The holy Torah scroll and Torah ornaments, from the Ashkenazi and Sephardic traditions; 2) life cycle events and Jewish holidays around which Jewish life revolved and; 3) the cultural essence of every Jewish home- secular or religious. The treasures include a seder plates, candle sticks, chanukiyot, rare books, and other Jewish ceremonial objects. MOT youth education programs wake up youth conscience and stimulate a lifelong commitment to values of respect and service. Through age-appropriate Museum tours and workshops, children and youths are exposed to important life skills of critical thinking and inter-personal communication. Adopt a class or a whole school to provide students with access to experiential learning and resources that will engage them in creating their own peaceful futures. Known in LA as ‘the place to see it first', the MOT has been pre-viewing award winning films and assembling the most notable authors and film-makers of our time for over a decade. Sponsor one event or a year-long series and support a public program that leaves a lasting impression. Every day is family day at the MOT but these occasions are uniquely exciting and rewarding for families. With award winning book authors, art projects, music, and the library's mobile book cart, Family Sunday events provide imaginative and meaningful quality time for LA's diverse families. Sponsor one Family Sunday or a series and make admission free for all. If you believe in the potential of young people to contribute to their neighborhoods and promote values of inclusion and responsibility, then sponsor a leadership development program that will help equip them for a lifetime of achievement. The Museum offers various youth leadership programs, from its annual service learning process, to inter-cultural outreach and the Tools for Tolerance® for Teens program. Sponsor students in Hawaii, Alaska or anywhere in the U.S. to see and interact with a witness to history via the MOT's distance learning program. “Bridging the Gap” connects students via videoconferencing with speakers who have important stories to tell. They include Survivors of the Holocaust, leaders of the Civil Rights Movement, and even former hate crime offenders who give insight into the dynamics leading to hate group affiliation. The program includes teacher's guide materials, artifacts shown by a special camera, and Q and A between the students and the speaker.